Marie Zuchowska Pawlowski was my 2nd great grandmother. She was born around 1851 in what is present day Poland. Here is the only photograph I have seen of her. I obtained it from my 1st cousin 1x removed who knew little more about her than her name. And possibly a daughter, Antoinette Pawlowski, although I do not know where I got this information or why it was in my notes. The first mention of Baltazar and Marie that I found in the U.S. was from the 1910 census. They lived with their daughter and son in law, Catherine Pawlowski Puchalski (1883-1951) and John Puchalski (1878-1939). Their address was 563 Willis East (present day 1969 Willis) in Detroit, MI. 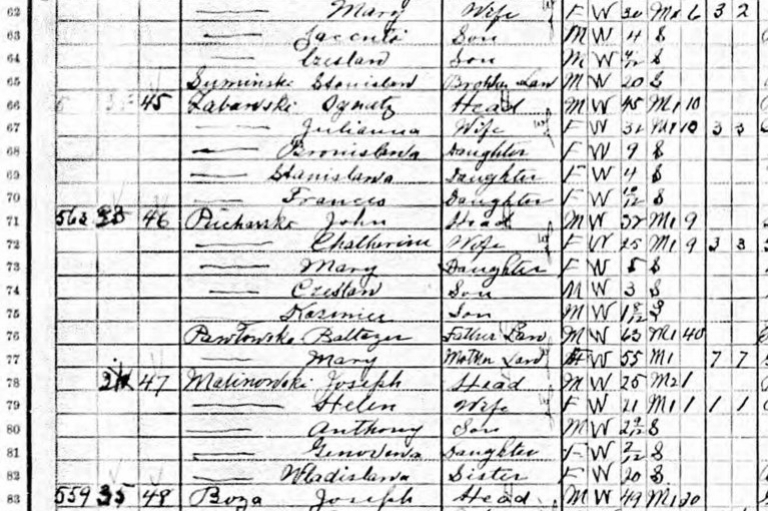 At the same street address, just below them on the census, you see the Malinowskis: Joseph, Helen, and family. Helen was the daughter of Marie and Baltazar. These Polish immigrant families lived on the same block as St. Albertus Catholic Church, presumably where Marie and family worshiped and celebrated weddings, baptisms, and funerals. These census records indicate that Marie and Baltazar came to the U.S. in 1907, several years after most, if not all, of their children. I have not yet been able to find mention of Marie or Baltazar in the 1920 census. Baltazar appears to have died in 1919 which would explain this. I believe this is his death certificate. And here is a Find a Grave memorial for a “Balozer Pawlowski” connected to this death certificate. I will look for a gravestone on my next trip to Mt. Olivet Cemetery in Detroit. I am also on the hunt for relatives who lived at or near the 716 Garfield address listed on Baltazar’s death certificate. I would assume the Puchalskis lived there, but I’ve had a difficult time finding the records. In the 1930 census Marie appeared to again be living with her daughter and son in law, John and Catherine. They lived at 8097 Curt St. in Detroit. Marie listed as widowed. By 1940 Catherine was living, widowed, with two of her children at 8095 Curt. There is no mention of Marie. It is somewhat surprising that i have not been able to determine when Marie died. Her whereabouts from 1919 (when her husband died) and 1930 remain elusive. I do suspect that she lived with the Puchalskis all or most of that time, but I haven’t been able to document it yet. I will keep you posted on new findings! Until then, I hope you’ve enjoyed learning a little bit about my 2nd great grandmother! When did Marie die and why am I having difficult finding out? What was her life like, especially between some of the more mysteries years between 1919 and 1930? What was her trip to America like around 1907? What was her life like in Poland? Are there any other photographs of Marie? Is my analysis here more or less correct? Have I made any errors or missed any clues? Ceil Wendt Jensen is an internationally renowned expert in Polish Genealogy. She was gracious enough to answer some questions about her professional and personal story. This is the 43rd of 52 weekly posts planned for 2018. It was inspired by the #52Ancestors writing challenge issued by professional genealogist, Amy Crow Johnson. The challenge: once a week, for all 52 weeks of the year, write about a relative in your family tree.